The ASP has been invited to participate in the Asia-Pacific Development Center on Disability’s (APCD) initiative to promote awareness of emerging disability sub groups like autism and intellectual disability. APCD dedicated a photo gallery section in its Empowerment Café website for this purpose, where viewers can gleam regional best practices and personal inspiration. 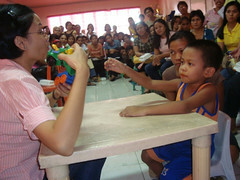 Autism Society Philippines (ASP ) chapters are invited to send pictures of its activities; while individual members may send pictures of their child engaged with their siblings, parents and service providers in different settings like in school, home, therapy center, park, cinema, among others. Images must observe good photography composition and lighting; and must not be "Photoshopped" to include text, logos or watermarks. Pictures for exhibition must be sent to the ASP National Office at autismphils@gmail.com with a brief description (maximum seven (7) words) and a note authorizing ASP to add an ASP watermark and to include the image in the APCD E-Cafe Photo Gallery. All images submitted will only be used for this purpose. It will be published with attribution. It will not be edited or used for commercial purposes. The E Café photo gallery can be viewed starting September 1, 2012 by logging to http://disability-ecafe.net/. The APCD Empowerment Café or E-Cafe is a platform that promotes information dissemination and knowledge exchange on disability and development in Asia and the Pacific from the perspective of the sub-regions Southeast Asia, South Asia, Central Asia, Pacific and East Asia. ASP is one of the “baristas” or writer representing the ASEAN Autism Network (AAN) at the E-Café.